Madonna has given a sneak preview of her new stage role as she rehearsed for her West End stage debut. The star posed for a series of arty black and white shots as she prepared to open in the sell-out run of the play, Up For Grabs. In one shot many Madonna fans would have been left wondering "Who's That Girl?" 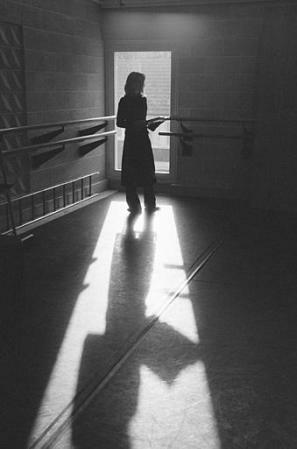 as she stood in silhouette with light flooding through a doorway behind her. She appeared to be enjoying herself as she ran through the biting satire on the art world which first opened in Sydney, Australia, last year breaking box office records. Director Laurence Boswell said rehearsals were going well: "Everyone is extremely relaxed. It's a wonderful company." Previews of the show, which also stars Tom Irwin, begin on May 13 at Wyndham's Theatre and the production has its official opening 10 days later. Technical difficulties have meant the show opens three days later than originally planned. (source: Ananova) Click on the thumbnails to enlarge the pictures. Preview performances of Madonna's long awaited West End stage debut have been postponed because of technical hold-ups, producers have announced. The complex staging of her production Up For Grabs has meant the first preview will not take place until 13 May. Ticket-holders for the cancelled shows are being offered alternative dates, with three extra performances added. The axed shows, at Wyndhams Theatre on 9-11 May, will be replaced by performances on 13 May, 6 July and 13 July. A statement said: "The production has developed into a complex synchronicity between moving set, sound, music and projection and realising it in an older style theatre like the Wyndhams has increased necessary technical time." Ticket holders will be offered either tickets for one of the extra shows or a refund. It is not the first hitch to disrupt plans for the production - daytime performances were dropped due to the singer's recording commitments. Up For Grabs, written by Australian David Williamson, is a satire on the art world. It broke box office records when it opened in Sydney in February 2001. The play, which has a cast of seven, will be directed by Laurence Boswell, whose recent credits include A Day In The Life Of Joe Egg and Popcorn, by Ben Elton. After the previews, it will formally open on 23 May. (source: BBC) A special hotline has been set up to deal with the changes on 020 7369 1796. London's Victoria and Albert Museum is to pay tribute to late designer Versace. The museum is planning an exhibition in autumn. Exhibits will include creations worn by Princess Diana, Sir Elton John, Madonna and Courtney Love. 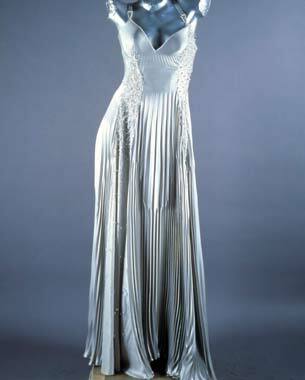 (source: Ananova) Madonna donated the stunning dress she wore during her Bedtime Story performance at the 1995 Brit Awards. Mad-Eyes offers you short demo clips from two unreleased Madonna tracks: 'Revenge' and 'Gone' (not to be confused with Gone from the Music album; both are leftovers from the Ray Of Light recording sessions). Click to download. Read an interview with Peter Rauhofer at DJ Times, where he talks about remixing for Madonna. He mentions remixing Runaway Lover and how Warner wanted to release it as a single but then changed its mind. I'm sure he means Impressive Instant though. Check out the new section of Sp!n Online: Sp!n Extended, which features classic Sp!n remixes inspired by the 12" 80s and 70s extended versions. Now ready for download: Another Suitcase In Another Hall and Drowned World/Substitute For Love, with more to come soon. Check the Brazilian fansite Madonna Online for scans of ICON Magazine #37, which has been sent out to members. Soon the new version of Madonna's Ashram will be launched, but now you can check the site to listen to a short, previously unheard sample of Madonna. To know what it really is - possibly a demo from an old recording session - we'll have to wait for the launch early May. Check Madonnarama for a scan of the Madonna's letter that's being sent out with the latest edition of ICON Magazine. In an unprecedented move into supporting football, Madonna is backing the England World Cup squad, writes Paul Thomson. The superstar American singer and her English film-director husband Guy Ritchie are backing Sven-Goran Eriksson's England team by signing a joint message on a St George's Cross flag. Madonna's message to the team said: "Come on chaps. Ra, ra, rattle rattle - bring that ruddy cup home." The gesture is just the latest tying Madonna, 43, to her adopted home. She lives near Marble Arch and has chosen to bring up and educate her two children, Rocco and Lourdes, in England. Her husband Ritchie cast footballer-turned-actor Vinnie Jones in his hit film Lock, Stock and Two Smoking Barrels. The Football Association and sponsor Nationwide want to create theworld's biggest fans' flag, which will measure 20 x 10 metres. The flag can accommodate up to one million signatures of support from England well-wishers. Fans can go online to www.TheFA.com/flag to register their details and leave a good-luck message. Other celebrities including Davina McCall, Tim Henman and Johnny Vaughan have joined Madonna to pledge their support by signing a smaller version of the flag. All proceeds from the sale of the flag - which will be taken out to Japan and presented to the England players - will go to the National Society for the Prevention of Cruelty to Children. Eriksson is also a big fan of the flag and said: "This campaign is amagnificent way of symbolising the entire country's support for the national team. "We will travel to the World Cup with wonderful support behind us, it will mean a lot to me and all the players." ~ Like most articles this one also forgets about Madonna's short theatre debut in 1986's Goose And Tom-Tom.